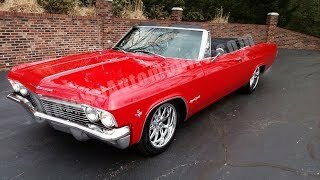 Hi, I am interested in your 1965 Chevrolet Impala (stock #1774) listed on Autotrader for $48,900. I'd like to get more information about this vehicle and confirm its availability. RECENT RESTORATION, straight, solid rust-free body and floors, show quality paint, 350/300 hp engine with turbo 350 automatic transmission, power steering, power disc brakes, 3 lowering springs, 20 & 18 Chrome US wheels, nice stock interior bucket seats and console, Custom Auto Sound stereo, new power convertible top, this is cool top-down cruiser, runs and drives out great. Additional photos available on our website at www.oldtownautomobile.com.